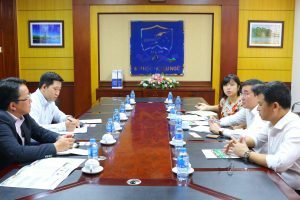 On September 20th, 2018, the University of Languages and International Studies – Vietnam National University, Hanoi (ULIS – VNU) held a meeting with the Overseas Manpower Development Organization (Japan) (OMDO) to discuss cooperation opportunities in internship programs. 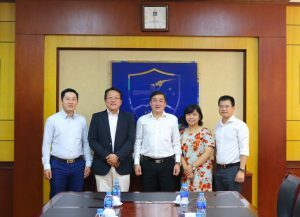 The meeting was attended by Mr. Nguyen Xuan Long – ULIS’s Vice President, Nguyen Van Son – Director of the Center for Resource Development, Nguyen Huyen Trang – Deputy Director of Politics and Student Affairs Office. On behalf of the Overseas Manpower Development Organization (Japan), Mr. Nakajima Minoru – Representative Director of the Organization attended the meeting. At the beginning of the meeting, Vice President Nguyen Xuan Long extended his greetings to representatives of the organization. He also introduced ULIS – VNU, the university’s internship activities for students as well as the cooperative activities with Japan. Expressing his gratitude for the enthusiastic and warm welcome of ULIS, Mr. Nakajima Minoru then introduced the Overseas Manpower Development Organization, Japan, wished to cooperate with ULIS in internship programs and stated that OMDO was always ready to listen and satisfy demands from ULIS so as to ensure the spiritual and material interests of ULIS’s students during their internship in Japan. 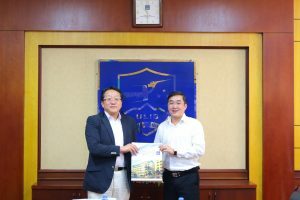 Subsequently, the two sides had frank and detailed discussion about issues related to sending ULIS students to Japan as trainees as well as legal regulations, conditions and processes of internship programs in the host country. At the end of the meeting, the Vice President expressed his gratefulness to Mr. Nakajima Minoru for the information and hope for the cooperation between ULIS and OMDO in the near future.